Brian Marz's Fly Fishing Oregon Blog: Willamette Valley Steelhead Counts are Screaming for Some Swinging Flies! 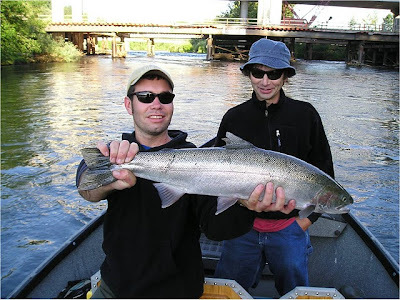 Willamette Valley Steelhead Counts are Screaming for Some Swinging Flies! With all of the high water, the summer steelhead counts have been kind of going undetected. This year happens to have some of the better fish counts in recent years, and not many people have been putting any pressure on these robust fish. More or less, many of these fish have been sliding by without anyone throwing anything to them. Now that the water levels are dropping and stabilizing; it is time to get out there to target these summer steelhead. We are at the time in the run when the fish are coming in with the largest numbers, and it should remain strong until about the 4th of July. After that the fish counts will slow up, and then they will pick up a bit more in the fall again. This does not mean the fishing will slow down. These summer steelhead will hang out in the river for literally about 9 months, and they do not spawn until next winter (Jan, Feb, March). The fishing stays red hot throughout the summer, and into the fall when the rivers turn brown, and you decide to fish elsewhere. Now is the time to target these fish; especially if you like to eat fish. The summer steelhead run in the Willamette Valley are mainly a hatchery run, and the fish are stocked to be a "put and take" fishery. This way we can be eating quality fresh anadramous fish; while not having to supposedly interfere with the "wild fish" stocks. Nonetheless, the fish are full of vigor, and they have tons of fatty omega three acids to make them savory and desired. The same hens that have skeins of eggs that are larger than a trophy trout in the fall, will have tiny skeins that are no larger than a finger with 1000's of immature eggs. These eggs will develop in the freshwater portion of the steelhead's lives by utilizing those fatty acids for sexual development. Thus one of the major differences of the physiology of the summer and winter steelhead. That is why catching one of these summer runs right now can be so awesome. They are so sexually immature to the point where they fight with vigor and cartwheel aerials like you have never seen. Get out there and experience it!